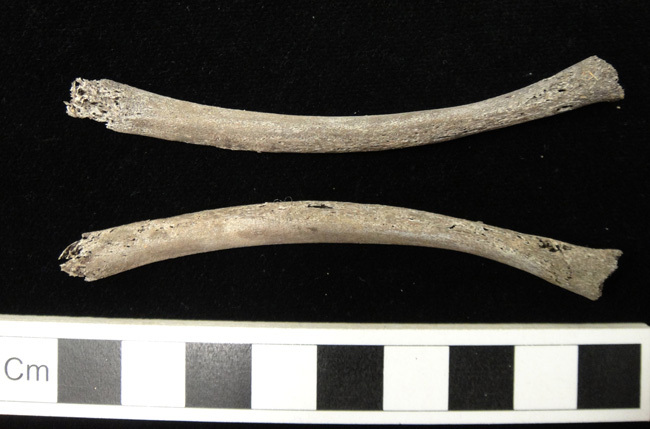 What can you learn from old bones? Rachel Ives explains what they tell us about the lives and deaths of the dead, and how osteologists use historical sources such as the Medical Officer of Health reports to confirm their findings and fill in the gaps. In 2011, AOC Archaeology completed an archaeological excavation at St John’s Primary School, Peel Grove, in Bethnal Green, London, ahead of the construction of a new nursery school. The site was a former burial ground privately run as a commercial business by pawnbroker John Kilday. The burial ground was intensively used – 20,000 individuals were buried over just 15 years from 1840 – 1855. Lodging House in Field Lane. Illustration from Sanitary ramblings. Being sketches and illustrations of Bethnal Green by Hector Gavin, published 1848. AOC excavated 1033 burials and completed a detailed post-excavation analysis of the human remains. From this we can identify a wide range of pathological conditions that illustrate the health of Victorian Londoners. These included chronic respiratory infections as well as specific infections (tuberculosis, venereal syphilis), accidental dislocations and fractures, neoplastic and tumourous conditions, nutritional deficiencies (such as vitamin C deficiency scurvy) and dental diseases. Examples of treatments were also found including a denture made from a lead plate and two unhealed amputations. Historical records are important in helping to put our archaeological discoveries into context and to better understand past lives, especially from the 18th and 19th centuries. 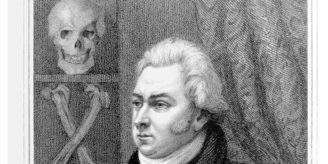 The recent digitisation of mid-19th century Medical Officer of Health Reports by the Wellcome Library (London’s Pulse) provides a tremendous resource of contemporary medical insights into sanitary conditions and causes of mortality across London. Reports by Samuel Pearce, Medical Officer of Health for St. Matthew, Bethnal Green between 1855 – 1857 refer to the period in which some of the excavated individuals lived. These direct observations help to expand on the interpretations that we can draw from the surviving physical remains of past Londoners. By the mid-19th century, Bethnal Green contained over 90,000 inhabitants and was regarded as one of the poorest parishes in London. It was described as having “long possessed an unenviable notoriety on account of its neglected state and defective sanitary condition” (Gavin 1848). New housing was rapidly built to support the growing population but often utilising undrained land and former ponds, leading to damp dwellings. Insufficient sewerage provision in the parish meant a reliance on cesspools and privies. Pearce reported “… in certain cul-de-sac houses, as in Providence Place, the privies belonging to the houses behind abut on the walls and infiltrate ordure under the floors” (Bethnal Green MOH report, 1855). He also repeated the Registrar General’s damming statement that “the cesspools now under our houses will inflict more pains and destroy more living than 10,000 mad dogs let loose in our streets…” (Bethnal Green MOH report 1855, p.15). 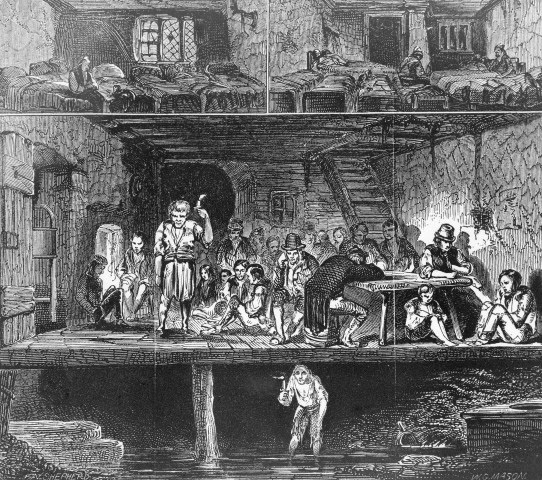 Pearce attributed many cases of illness, including scarlet fever, typhus, smallpox and cholera, to open sewers (e.g. Nelson Street) and drains (e.g. Cambridge Circus) and drew attention to the “disease-inviting” back to back houses, including Alfred and Beckford Rows, and “pestilential blind alleys” in Gibraltar Walk, Church Street and Friar’s Mount. Contemporary reports indicate that a large number of individuals who died from cholera were interred at the Peel Grove burial ground. As many water-borne and insanitary-related illnesses often cause death rapidly, they leave little trace on the skeleton. Correlating historical and osteological evidence together allows us to provide a more complete interpretation of health impacts from this population sample. 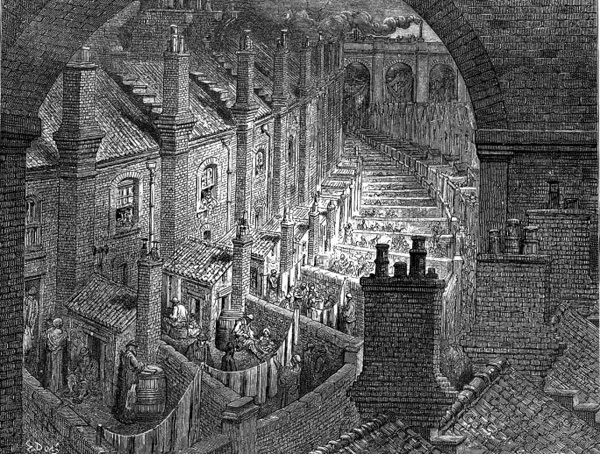 London slums, engraving by Gustave Dore in London: a Pilgrimage, published 1872. 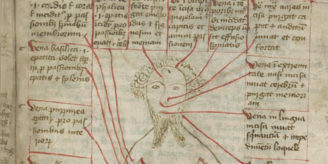 Wellcome Images reference: L0000877. Pearce also highlighted that improvements to sanitary provision alone would not be enough to reduce illness in the parish. He considered that “were it possible to disperse certain numbers among the new dwellings, our health might improve, or not retrograde. But poverty, which compels herding together, is the poison that prevents such circulation. Our crowded streets and courts are therefore becoming more over thronged. So mortality mounts up, and physical degeneration results” (Bethnal Green MOH report, 1857). Overcrowded dwellings in narrow courts and alleys often created dark streets, which were exacerbated by air pollution due to coal smoke from domestic and industrial fires. Pearce described the parish as “..being densely peopled by the poorest class and having but little breathing space…..while hundreds swarm like bees, in close, un-sunned, low-lying courts….”. This description of the parish is particularly revealing as a deficiency of vitamin D, which develops in children as rickets, was frequently observed, affecting 21% of the 658 children studied. Rickets is caused by a lack of sunlight exposure and a lack of foods containing vitamin D (e.g. oily fish and eggs). There are low levels of vitamin D in breast-milk if mothers are deficient, and in pre-fortified cow’s milk, which was often adulterated during the 19th century. Example of bending fibulae from the lower leg of a 19th century child from Bethnal Green with vitamin D deficiency rickets. Image credit: copyright AOC Archaeology Group. In Bethnal Green, rickets often developed in children aged five years of age or under and in some examples, chronic under-nutrition and growth stunting had occurred indicating poor child care amid challenging living conditions. The results of the excavation and documentary analysis of this 19th century private burial ground have provided a fascinating insight into past London lives. A monograph dedicated to this site will be published in 2015 by AOC. Updates on the project can be found on the AOC website. Author: Rachel Ives is an osteologist at AOC Archaeology specialising in the analysis of archaeologically excavated human remains. Thanks, this is a really interesting blog post, I enjoyed reading it. Readers may be interested to learn that they can access historical collections about Bethnal Green (and other parts of the East End, such as Poplar and Stepney), for free, at Tower Hamlets Local History Library & Archives, in Mile End. More information about our collections and services can be found here: http://www.ideastore.co.uk/local-history.